Hollywood, CA…Near the beginning of Black Mass, Johnny Depp, portraying Boston crime boss James “Whitey” Bulger, tells his young son that he should only “punch someone when no one is looking.” It’s an apt statement to describe the elder Bulger, who lingers in the background until it’s time to strike. It also applies to the film itself, which—while flawed—is a dark and understated crime drama that concerns itself with backroom dealings, shady meetings, and at times, shocking violence, most of it committed by Bulger himself. 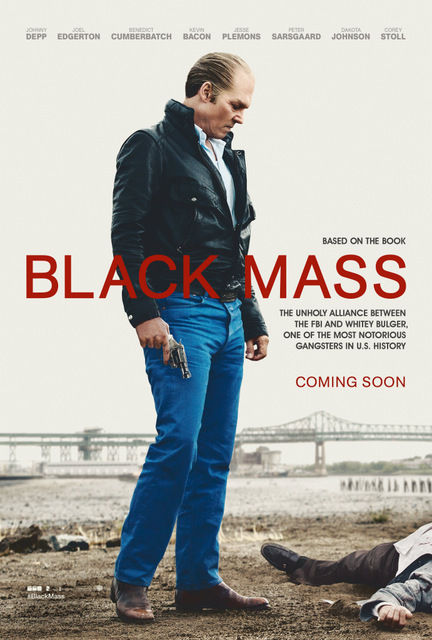 Billed as the story of “the unholy alliance between the FBI and Whitey Bulger, one of the most notorious gangsters in U.S. history” and based on the book of the same name, Black Mass primarily focuses on the relationship between Bulger and his FBI handler, agent John Connolly, played by Joel Edgerton, complete with a massive nose. The film begins in 1975, with Bulger as the leader of the small time Winter Hill Gang in south Boston, or “Southie,” as the locals call it. Following the return of Southie native Connolly to the area, the two men enter into a “business arrangement,” as Bulger calls it. But while Connolly schemes to use Bulger’s information to bring down the powerful Italian mob in the city, “Jimmy,” as his friends know Bulger, has other plans. Meanwhile, Connolly is drawn into the seductive life of crime, until the line between cop and robber becomes blurred. From there, the story jumps ahead to 1981 and 1985 as Bulger expands his operations alongside his friend Stephen Flemmi (played excellently by Rory Cochrane), hitman Johnny Martorano, played by W. Earl Brown, and to a lesser extent, his younger brother Billy Bulger, played eerily convincingly by Benedict Cumberbatch. Also on hand are Matt Damon lookalike Jesse Plemons (Todd from Breaking Bad, here looking perfectly ridiculous in a 70s style pomp wig) as right hand man Kevin Weeks, Kevin Bacon as FBI superior Charles McGuire, and Corey Stoll, fresh off House of Cards and Ant-Man, in the small but pivotal role of FBI watchdog Fred Wyshak, who is determined to bring down Whitey at any cost and harbors his own suspicions about Connolly. Make no mistake: the casting is excellent, although one has to wonder about the minimal female presence in the film (although, to be fair, the real-life players were all men, and the one fleshed out woman, Connolly’s wife Marianne, gets a few extremely well done scenes courtesy of actress Julianne Nicholson). Rory Cochrane takes to his role like a duck to water, and really gets across the conflict between loyalty and fear, though the film leaves no doubt as to where he ends up. Stoll and Bacon, meanwhile, are both good, if not great, as the hard nosed, no nonsense government agents, bringing exactly the right amount of edginess and frustration about bureaucracy to their roles. Last but not least, there’s Edgerton as the supposed hero of the piece (one thing about Black Mass: there’s no good guys). Edgerton is a good actor, having appeared in Star Wars and Zero Dark Thirty, and he’s fine here, but the audience never gets the sense that Connolly is conflicted about his increasingly close relationship with Bulger (and who knows? Maybe he wasn’t concerned in real life), and Connolly mostly comes across as a man in denial. That said, the second half of the film gives the character room to expand, and Edgerton’s performance is better as he portrays the panic of a man feared to be caught in wrongdoing. For all the excellence of the supporting cast, though, this is Depp’s show, and what a show it is. This isn’t his first time playing a gangster, having previously portrayed bank robber John Dillinger in 2009’s Public Enemies, but his performance here is by far the superior one. With pale skin, bleached slicked back blonde hair, (hence his nickname) and icy blue eyes (contacts, of course), Depp skulks around the screen like a modern day Nosferatu, lurking in the shadows. The idea of Bulger being a sort of boogeyman is further reinforced by the camera work placing him, solitary and shadowed, in the back of scenes. In fact, when it comes to Bulger, the film becomes downright Chiaroscuro (an art style using contrast between light and dark). It helps that Depp plays Bulger with understated, lingering menace, never raising his voice once in the film, making some of his scenes appear more like a horror movie than a gang drama. Depp has been in a bit of a career slump in recent years, but his role here is Oscar worthy, and is most certainly the primary reason to see the film. As for the rest, it can be summed up as technically competent but not spectacular. Director Scott Cooper mostly avoids familiar Boston landmarks and frames his shots within doorways, using backlights and harsh angles to convey the dreary greys and browns of Boston’s underworld. Splashes of color here and there add some punch, but it’s sometimes hard to focus on characters amidst the dark backgrounds. Curiously, the filmmakers obscure several important conversations with ambient conversation or music, leaving the viewer to interpret what was said. It’s an interesting choice, but not one that works particularly well, as the viewer is left dependent on other characters to fill in the blanks rather than doing it themselves. Concerning the score, it’s practically nonexistent next to a few licensed songs, making some scenes come across as lifeless and dull in contrast to what’s happening onscreen. However, accolades should be given to the costume department, which not only captures the 70s aesthetic well, but also makes Bulger stand out by consistently placing him in dark clothes compared the white of his partners. It’s also interesting to note that as Connolly becomes more and more embroiled in Bulger’s world, his wardrobe changes from light to dark colors. The biggest issue with the film, though, is how short it feels. Clocking in at two hours, it ends with Bulger fleeing Boston in 1994 and then abruptly jumps ahead to his arrest at age 81 in 2011, when he was discovered living in Santa Monica, CA. Coupled with the time skips, some of which are awkwardly edited, the film seems choppy, and there’s the definite sense that some of it ended up on the cutting room floor. Despite these flaws, Black Mass is a dark and dramatic gangster movie, and Johnny Depp is frightening and fun as Whitey Bulger. For fans of films like The Departed, this one is worth checking out, and it makes a welcome entry to fall movie season.